The New Year has begun with a bang for me and despite the winter bluster, my spirits are high! 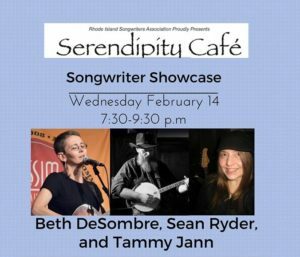 Some exciting news is that I was asked to perform in the Songwriter’s Showcase at the Serendipity Cafe in Maynard, MA on February 14th. More information on this event can be found in the “SCHEDULE” section. I am so excited to share the stage with my two talented FAWM friends, if you are looking for something to do or share with your loved one, please come and hear our original songs!! I am also excited for the newest adventures for our songwriting group (SONG)! We have moved to the Nashua Public Library and have had a small time change and now we sport this FAB LOGO!! For more information if you would like to come and share your original songs, please go to the “SCHEDULE” section! Hope to see you there! I have uploaded some new poems in the “POETRY” section of the website, “Karma”, “I Have Strayed” and “Hurricane” are my latest works, I hope you will give them a read. My newest collaborative song is now in the “MUSIC” section called “Show Me”, my friend George and I have had great feedback on it, let us know what you think! I have also added some spooky, winter photos I took at the cemetery when a delicious fog settled over our town, I couldn’t help myself, if anything it might spark off some inspiration for FAWM which is starting soon (FAWM dot org write 14 songs in 28 days). Let the winter wind push you into a good direction, let the ice and snow inspire you and have fun looking around my website and I hope to see you at the Serendipity Cafe in February!